With the ever-increasing deluge of information we all face, the task for each of us is to discern which inputs are relevant to our work and which are simply noise. We face tremendous pressure to keep up and the vast majority of creatives I work with say they are constantly on the verge of information overload. But it's not just the sheer amount of information that's the problem; if it were that simple, we could just shut it off. The real challenge is that some of this onslaught of information is necessary for us to perform our jobs, whether it's e-mail, blogs, trend reports, or industry news. We must somehow engage with the information that enters our daily lives, process it, and turn it into something meaningful. Bryn Mooth, editor of the design magazine HOW, told me in an interview that she compares this struggle with a food processor. "A food processor has a small intake, and a huge work bowl," she says. "All of the food has to get through the processor, but there's only so much capacity at any given time. This is similar to how we must deal with the overload of new information we experience every day. We simply don't have the capacity to process all of the information in a timely way with our limited mental resources." She continued that she frequently advises creatives to closely monitor the quality of what they choose to absorb because it is so closely tied to their creative process. While our minds are unparalleled in their capacity to experience and assimilate information, they also have a limited bandwidth for doing so. As a matter of survival, they tend to weed out information that is deemed irrelevant to our immediate needs. However, our minds are also capable of taking random bits of input and forging brilliant connections that are not apparent on the surface. This is essentially how the creative process works -- it's the connection of multiple preexisting patterns into new solutions. One pathway to creating more effectively and consistently is to be strategic about our inputs. I call the information and experiences we absorb "stimuli" because these are the raw materials that stimulate thought. Each creative idea is the combination of previously existing ideas, or bits of stimuli, into something new. The stimuli we experience can stretch us to think differently, to open our eyes to new ways of seeing the world. But many creatives don't give much thought to what they allow into their minds. E-mails, reports, web videos, TV, magazines, and more flood their life with no one keeping watch of the gate. Over time this can result in an overall lack of focus or a general numbness to potential inspiration. Discerning what is useful and what isn't in a world without filters on our stimuli becomes a difficult task. 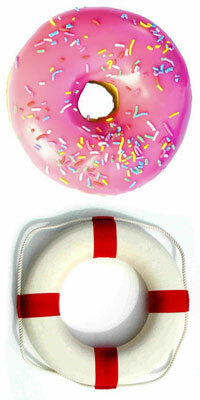 After all, a drowning man isn't thinking about what he wants for dinner, he just wants a life preserver! In the same way, when we lack structure around the types of stimuli we experience, we lack the space and focus we need to apply our experiences to the work we're engaged in. There is an old saying about health and nutritition, that "you are what you eat." This means that the kinds of food you put into your body will ultimately affect your physical being and your mobility and interaction with the world. If you regularly consume junk food rather than healthy and nutritious, you can occasionally snack on junk food with little concern. It's all about choice and following healthy principles with regard to diet. The same principle applies to cultivating a healthy diet of stimuli in your life. Because so much of the information you must process in a given day is determined by the nature of your work, you need to to be purposeful about including self-directed, thought-provoking, and capacity-increasing stimuli into your life on a consistent basis. Whether it's in the form of print media, movies, web videos, conversations, advertisements, or anything else that is delivering a message you must process and assimilate, the stimuli you take in over the course of your day informs the quality of the insights you generate. Just like food increases your capacity to be active and healthy, the higher the quality of your stimuli, the better you are setting yourself up for high-level breakthroughs. What are the characteristics that mark higher quality stimuli?